The Baroque Ensemble (DHSBE) is an orchestral ensemble which focuses on Early Music, Baroque and early Classical Orchestral Music. 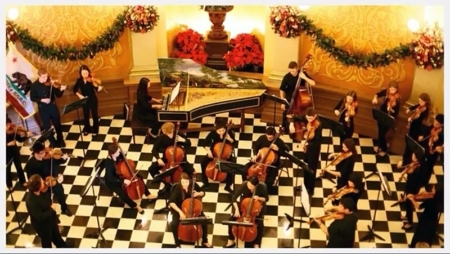 The ensemble performs on Baroque instruments, which includes string instruments converted to Baroque style with gut strings and Baroque style bows. The DHSBE is for those students interested in the study and performance practices of early music including Medieval, Renaissance, Baroque, and Classical periods, including composers such as Bach, Vivaldi, Corelli, Telemann, and Handel. This performance ensemble is open to the following instrumentation: violin, viola, cello, bass, Key Board – Harpsichord. Auditions are held each spring for the following school year. For further information, please contact music instructor Angelo Moreno. Learn more about how the DHSBE became the first public high school baroque ensemble, and about how we acquired our John Phillips harpsichord.